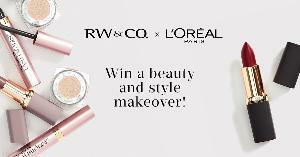 Prize: 1 winner: $500 RW&Co gift card and a L’Oreal gift basket. 10 winner: $100 RW&CO. gift card PLUS a $100 L'Oréal gift basket. (Total: $3,000). Statistics: This contest was opened by 119 and entered by 31 ContestChest.com members. 26% of those who opened the contest, entered it.